Painter, part of a French family of painters. Ren-Antoine Houasse was principally a decorative and religious painter in the manner of Charles Le Brun. His son Michel-Ange Houasse (1680-1730) was employed at the Spanish court of Philip V.
A pupil of Charles Le Brun, with whom he later collaborated in the decoration of Versailles, Ren-Antoine was received (reu) by the Acadmie Royale in 1673 with the portrait of Louis XIV in the Guise of Hercules Overcoming the Hydra (Paris, Louvre). He went on to have a brilliant career within the Acadmie, becoming Assistant Professor in 1675, Professor in 1680, Assistant Rector in 1695 and finally Director in 1701. He was also Director of the Acadmie de France in Rome between 1699 and 1704. 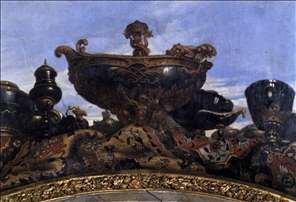 See more details about "Precious Vessels (detail of the ceiling)"